This article aims at introducing the concept of manipulative abduction, by showing how we can find at various levels of cognitive activity various methods of manipulative constructivity. From this perspective, also creativity and discovery are no longer seen as mysterious irrational processes, but, thanks to constructive accounts, they are viewed as complex relationships among different inferential steps that can be clearly analyzed and identified. I maintain that the analysis of the blending of external and internal representations and of what I have called epistemic mediators is important not only to delineate the actual practice of manipulative abduction but also to further enhance the development of programs computationally adequate in rediscovering or discovering for the first time, for example, scientific hypotheses or mathematical theorems and to favor the design of more realistic and efficient robots. I will focus on those particular kinds of abductive cognition that resort to the existence of extra-theoretical ways of thinking – thinking through doing – centering the attention to the fact that many cognitive processes are centered on “external representations,” as a means to create communicable accounts of new experiences ready to be integrated into previously existing systems of experimental and theoretical practices. 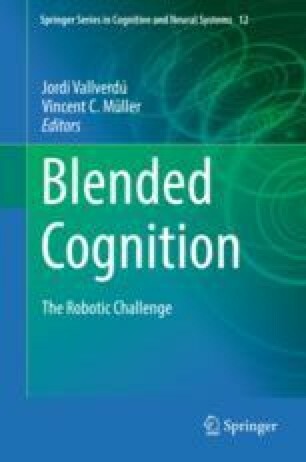 Parts of this article were originally published in Chapters 1 and 3 of the book Abductive Cognition. The Epistemological and Eco-Cognitive Dimensions of Hypothetical Reasoning, Springer, Heidelberg, 2009. I also reused with permission: the section “Constructing Meaning through Mimetic and External Objects” of L. Magnani, Semiotic brains and artificial minds. How brains make up material cognitive systems, in: R. Gudwin and J. Queiroz, eds., Semiotics and Intelligent Systems Development, Hershey, PA, pp. 1–41, Ⓒ2007 IGI Global; the sections 3 and 4 of L. Magnani, Multimodal abduction. External semiotic anchors and hybrid representations, Logic Journal of the IGPL 14(2): 107–136, Ⓒ2006 Oxford University Press; the sections 4 and 5 of L. Magnani, External diagrammatization and iconic brain co-evolution, Semiotica 186(1/4): 213–238, Ⓒ Magnani (2011) Walter De Gruyter. For the instructive criticisms and precedent discussions and correspondence that helped me to develop my analysis of manipulative abduction and distributed cognition, I am indebted and grateful to John Woods, Atocha Aliseda, Woosuk Park, Luís Moniz Pereira, Paul Thagard, Ping Li, Athanassios Raftopoulos, Michael Hoffmann, Gerhard Schurz, Walter Carnielli, Akinori Abe, Yukio Ohsawa, Cameron Shelley, Oliver Ray, John Josephson, and Ferdinand D. Rivera and to my collaborators Tommaso Bertolotti and Selene Arfini.